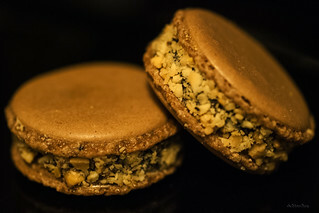 Nuts about macarons | SMØRGÅSBORD! 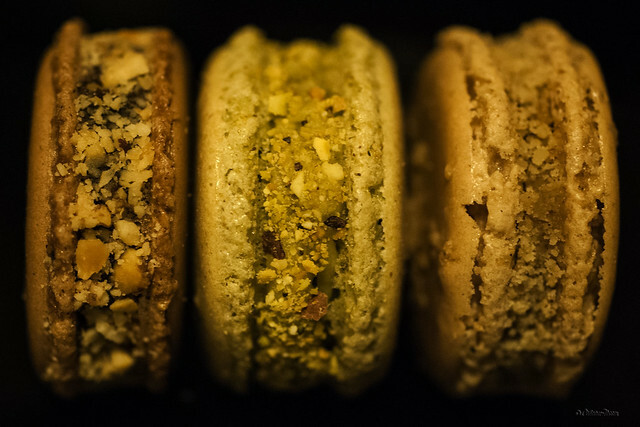 Peanut macaron with chocolate ganache, pistachio macaron with pistachio buttercream, and walnut macaron with maple-walnut buttercream. Spoon the batter into a piping bag fitted with a plain 1-cm (diameter) nozzle. Pipe out 3-cm (diameter) circles, each about 2.5 cm apart, onto non-stick baking paper placed on a baking tray. (Optional: sprinkle the tops with a bit of coarsely ground nuts do decorate.) 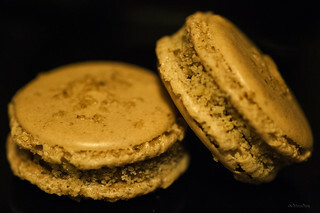 Rap the baking tray on the counter/table to get rid of excess air that could either crack the macarons or make them hollow. In a large bowl, beat the eggs with the caster sugar and caramel syrup at high speed until the mixture becomes fluffy and doubles in volume. Pour the egg mixture into a saucepan over medium heat. Add the walnuts and stir continuously until the mixture forms a compact batter. In another large bowl, beat the chilled butter at high speed. When the butter starts to expand in volume and become fluffy, add the chilled nut batter. Continue whipping until the mixture becomes homogenous. Spoon the buttercream into a piping bag fitted with a 1 cm (diameter) nozzle and set aside in the refrigerator until set (about 30 minutes). Pour the hot cream over the chocolate. Let stand for a minute to allow the chocolate to melt. Roll the edges on some chopped nuts, if desired. 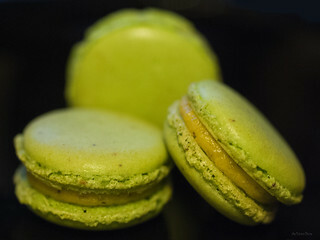 Previous PostLemon macaron with lemon curd fillingNext PostHow can the world be so cruel?